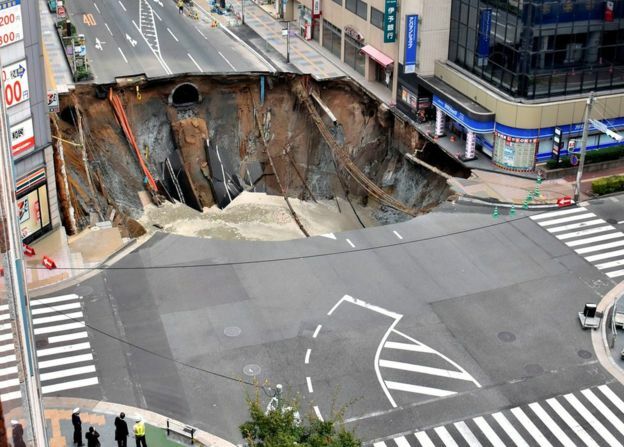 A giant sinkhole swallowed a five-lane street in the centre of one of Japan's biggest cities on Tuesday morning. 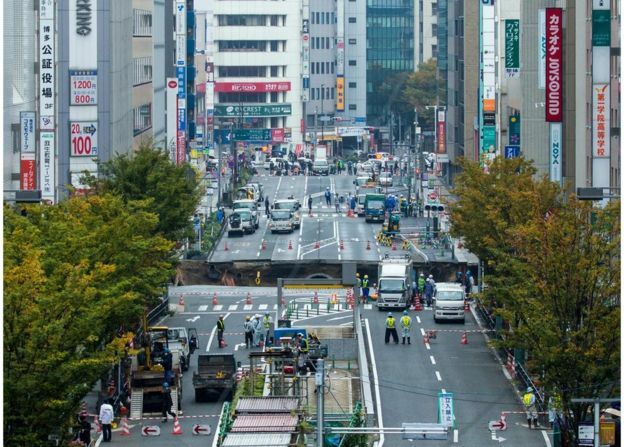 The collapse began at around 05:00 local time (20:00 GMT Monday) near Hakata Station, the busiest in Fukuoka city in the southern island of Kyushu. It began with two smaller holes that grew steadily until they formed one huge depression around 30m (98ft) wide. There were no reports of serious injuries but it disrupted power, water, gas and transport links in the area. Broadcaster NHK reported that an elderly lady slipped on some stairs because of the power cut. Engineering work to extend a nearby underground train line may be related to the sinkhole's sudden appearance, city officials said.